William B. Felker was born in Oshkosh, Wisconsin in 1866. His family moved to Denver when he was 15 and he graduated from the old Denver High School. His father was noted as a Lawyer, Railroad Commissioner, State Senator anda Judge. The Colorado Silver Boom hit in 1879 with the discovery of Silver in Leadville. It resulted in a flood of new emigrant prospectors. The resulting opulence was most lavish in that city. In the early 1880’s the Felker’s relocated to Leadville, possibly hoping to profit off these new miners and their families, where William opened a Crockery Store. Located in a prime location, above the Post Office, he sold anything in crockery, glassware, silverware, baby carriages, dolls, lamps, tea sets and almost anything in household “fancies”. In the late 1880’s William became interested in Bicycles and in 1891 he and a friend, rode from Leadville to Denver, via Colorado Springs, a trip of 213 miles on Victor machines. The Herald Democrat newspaper of Leadville stated, “It will be the longest (ride) ever made in the state.” Upon returning the paper said, “…a spirit of enthusiasm has been aroused (in bicycling) …”. Shortly after returning,William formed “The Wheelman” Bicycle Club. Eventually he became interested in racing the bicycles and finished second at the“Select Knights Picnic” in Buena Vista in 1892. It was a prestigious race and the medals of the winner and runner-up were put on display at a local Jewelry store. Later in the year at the “Knights and Ladies” gathering, Felker took home $15 for first prize in their bicycle race. Felker was involved in the city of Leadville; he volunteered and was Secretary of the Knights Templar Visit, involved in a Whist Card Club, elected as a Director of the YMCA, was listed as a contributor to the poor, started a Chess Club, was picked as a Juror numerous times, elected Secretary of the Masonic Temple, and made donations to the “Leadville Ice Castle”. Denver was made for Felker and by the end of the 19th Century, various bicycle clubs were already formed with races being held on the quarter mile track at the DAC Park (NE corner of East High School). Local clubswere racing against other clubs, and having contests from Denver to Greeley, Denver to Brighton, Denver to Boulder, Denver to Colorado Springs and even up Pikes Peak. Bicycling was the favorite outdoor sport at the turn of the century. Clubs had their own uniforms, participated in meets, races, tours and excursions. Dinner Races proved especially popular where the losing team bought dinner for the winners after the race. The first automobile was seen on the streets of Denver May 10th, 1899. Felker, along with a handful of others, was one of the first to possess one of the new horseless carriages. Almost as soon as automobiles were introduced to Denver, Felker began selling them. On May 1, 1900, the Denver Post ran the first automobile advertisement–the new Locomobile for $750 and could be seen at the Felker Cycle Co. 417 16th St.His first shipment of eight Locomobiles came in one rail road freight car. It is said to have been the first shipment of cars west of the Mississippi River. As you entered his display room,along the left-hand wall werenew bicycles and along the right-hand wall were new Locomobiles. Early in the new century it was said that William had the biggest selection in town, an article in Motor Fieldin 1904 said he had sold several Winton’s, a number of Autocars and three Peerless. 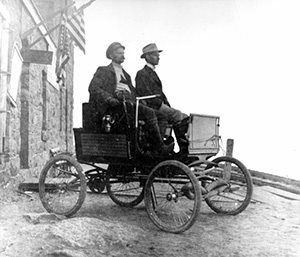 OnAugust 11, 1901, at the age of 35, Felker and friend C. A. Yont decided to make the biggest mobile stunt of their time…DRIVE TO THE TOP OF PIKES PEAK. They had conceived the idea a long time before, but people were convinced that it couldn’t be done. This feat had never been accomplished before, though it had been attempted twice. The men drove their 800-poundhorseless carriage from Denver to Cascade, making the 87 miles in 12 ½ hours, a record for that ride. With no more than a new stock Steam Locomobile, a couple of sandwiches, two pickles, instruction booklets and a few tools, they were able to conquer this Giant Mountain which, 15 years later, would bethe site ofwhat was to become the Pikes Peak International Hill Climb. This accomplishment was covered by the local press, as well as National press for many days. There were interviews withhim, his wifeDelia,his assistant Mr. Yont, and observers along the way that witnessed the feat. The Denver Times stated “This feat…has opened up possibilities in transportation and travel such as are difficult to grasp in detail”. The day before the paper stated, “The road, for three miles above Cascade, is passible to a lumber wagon drawn by a team of elephants, …the roads are washed out by recent rains and there are nothing but rocks and bowlders(sic)on the route. They will probably hit all of them.” “…five miles above Cascade, the road is so completely washed out that the narrow passage left would be impossible to a starved camel, although a fairly lean grayhound (sic) might creep through…”. Felker was never satisfied with his accomplishments and the attention that he received was not always positive, on or off the race track. In January of 1902, The Denver Times reported, “Felker was seen going down Sixteenth street by Chief Armstrong and Judge Thomas…at a speed of not less than 15 miles (per hour). The old ordinance provides that no vehicle shall be propelled at a greater speed than 8 miles”.TheDenver Times also reported in April of 1902, “FIRST SUIT GROWING OUT OF AUTOMOBILES. A suit arising out of an automobile accident, the first to be brought in this county was filed in the county court this morning by Dora Frank against William B. Felker, Jr. She wants $2,000 damages for injuries and losses which she avers she sustained March 12, when her horse ran away, frightened by an automobile belonging to Felker. She states that she was driving along Sixteenth street in a lawful manner, when Felker approached in his automobile, going at a rate of speed beyond the legal limit. As he drew near, he blew ‘one certain horn of which defendant was possessed’ and produced thereby ‘certain loud and unusual and screeching noises in great volume’ so that the plaintiff’s horse took fright and ran away and threw Mrs. Frank to the ground. She avers that she was in a delicate condition at the time, and that she suffered great injuries in this fall, and that the wagon which she was driving was broken”. In May of 1902, Felker won a historic race from Denver to Colorado Springs and back. “The Denver Times” called it the “GREAT RIDE OF FELKER”. It was said to have been “…the most marvelous piece of road speed work ever seen in this part of the country.” Felker’s assistant was G. A. Maxwell. “This pair dashed over the road at a rate of speed which is likely to stand as a record for some time…eight hours and seven minutes”. Jay lost $300 on the race but still believed that with a little bit of luck he could beat Felker. On July 3, 1902, Overland Park Horse Track (site of the present Overland Golf course,West of South Santa Fe Drive) hosted the first one-mile circle track automobile race in Denver. The first race consisted of five cars, not nearly as many as wereexpected; luckily the horse races were going on also. The automobile race did not create the enthusiasm that was expected. The machines were not equally matched, a 15 hp machine was pitted against an 8 hp machine. The equestrians looked at the automobile race as a huge joke. The throttle jockeys did not give up however, and the races improved. Barney Oldfield raced there, breaking many National records. In 1907 Motor Field magazine printed, “…the beautiful race course which is considered second to none in America”. Overland was complete with bleachers, field house, train and tramway transportation, spectator parking and a well-groomed dirt track. The Colorado Automobile Club met later in July and William was selected for the Good Roads Committee and the Endurance Test Race Committee. The Colorado Automobile Club hosted a Hill Climb July 1905 at Sacred Heart College (later known as Regis University). Felker, driving a Franklin,won Class No 3., gasoline cars, 12 horsepower, carrying two persons, with or without tonneau. September 1906 Felker had G. A. Maxwell drive a $2,500 Stevens Duryea in Class C, gasoline cars, not exceeding 22 horsepower. They took second place. The hill climb was held at Loretta Heights Academy. In June of 1907, at Overland Park G.A. Maxwell, driving a Stevens-Duryea owned by William Felker took 2nd place in the Five Mile class for stripped stock touring cars of any price range or horsepower. The winner of the event was an excellent driver, named Matthewson. Matthewson was a long-time nemesis of Felker’s. They also took another second and won the economy contest. WIN ON SUNDAY, SELL ON MONDAY. The day after the race Felker ran a large ad in the Denver Post. “HOW DID IT LOOK TO YOU? A 20 horse-power Stevens-Duryea defeated in the 50-mile race yesterday: A 60 H.P. Thomas, A 40 H.P Simplicity, A 40 H.P. Winton, Two 35-40 Oldsmobile and a 25 H.P. Pope-Hartford. We did this with our 2-year old rent car, which won the economy contest, going 13 miles farther on a gallon of gasoline than any of its competitors. You can rent this old car any old time. The only car which beat us was a specially built car sent from the East with an expert to win this race. Think it over—judge for yourself. Query—When it came to the regular stock car race, the kind you buy, not specially built, why did they withdraw a 60H.P. Thomas and a 40 H.P. Thomas and refused to raceagainst our Stevens-Duryea, with lamps, guards (fenders)and ready for the road? Were they afraid? Well think it over. P.S. With the lowest powered car in the races we won, ONE FIRST PRIZE, TWO SECOND PRIZES in three races, defeating a 60 H.P Thomas twice with a 20 H.P. Stevens Duryea. DID WE LOSE?The Felker Automobile Co. AGENTS FOR STEVENS-DURYEA , MANUFACTURED AT CHICOPEE FALLS, MASS.”Besides being a great race car driver, he was a great car salesman! The headlines of the September 2, 1907Denver Republican read: PREPARATIONS COMPLETE FOR BIG AUTO RACES. OVERLAND TRACKS ARE IN PERFECT CONDITION, INDICATING THAT RECORDS MAY BE BROKEN. Continuing the paper stated, “…prominent Eastern manufacturers and drivers who are quartered at the Brown (Palace Hotel) inspected the track yesterday and pronounced it to be in perfect condition, and freely predicted that new records will be established….Another big tank of oil was used to keep down the dust on the track yesterday and as far as possible every effort will be made to reduce the dust to the minimum both for the safety of the drivers and the comfort of the spectators…There will be special car service on the Rio Grande, frequent trains leaving Union Depot commencing at 12:30 o’clock, and also on the Tramway…Every precaution has been taken for the safety of the drivers. The course will be well protected. The spectators will be forced to remain in the grandstand…Only officials will be in the judges’ stand, and regular boxes will be provided for the press. Only dealers, owners and drivers having cars in the various races will be permitted on the grounds anywhere near the fence. On the day of the big race, wife Delia, 17-year-old daughter Wilma (it is said that she had the first driver’s license for a female in Denver), and Felker’s mother came to the track to watch the race. Felker was entered in three classes with Stevens-Duryea cars: Event No.1-Five miles for stripped stock gasoline touring cars of any price or horsepower, Event No.2- Five miles for fully equipped gasoline cars with tonneauto carry three passenger and driver, Event No. 5-Great Colorado endurance race. 50 miles, for cars of all classes, open. It was said to have been a beautiful day, huge crowd…15,000 in attendance, one of the largest crowds ever seen at Overland, and Mr. Felker was on a mission. He began by winning the first race and then one of his Stevens-Duryea cars won the second race. The 5th race was the premier race of the year. Motor Field reported, “Seven of the speediest stock cars in the country were entered, many of them…having been shipped from the East especially for the purpose of lowering the world’s record for fifty miles…”. “The nerviest drivers from both Denver and out-of-town ranks were engaged. Felker…spurned the idea of hiring a substitute to pilot the Big Six 50 H.P. Stevens-Duryea. …E. Lynn Mathewson…entered the Thomas car, holder of the record.” Mathewson had been injured in a previous racing event, and allowed Harold Brinker to drive his title holder. Others included Phil Kirk from Chicago driving an AppersonJack Rabbit and C.V. Dasey as his assistant; George Maxwell in the Little Six Stevens-Duryea (one of Felker’s cars);J.T. Dickson in the Colburn car;A.W. Marksheffle in a Ford; and Paul Tobin with an Oldsmobile. It is said that after winning the first race Felker went into the grandstand and sat with his family. When the call went out for the cars entered in the 5th race, he left the stands and climbed into his car. He left his family with a determination to win. There had been a rivalry between Felker and Mathewson for years and the only car he wanted to beat was Mathewson’s driven by Brinker. Felkerwas a runner-up to Matthewson three months earlier. Just before the start of the race William scanned the grandstand for his family, located them, smiled, and waved. It was a clean start and the cars battled for position.Felker went out on the pack and led Brinker by about 100 yards shortly after the start. On the 6th lap and in 6th place, the Apperson that Kirk and Dasey were in, speeding around the fourth cornerand heading into the straightaway, had the right rear tire come off, and lodged in the chain. Quickly the car turned around and started back in the opposite direction. The quick turn had thrown Kirk and Dasey out. Dasey was hurt, but Kirk was on his feet and ran to help Dasey. Kirk grabbed his arm to pull him tosafety when another race car rounded the corner and ran over Dasey. When the car struck Dasey, it threw him two feet in the air, breaking his neck, crushing his chest, and killing him instantly. Through the dust and smoke, officials ran on to the track and drug Dasey to the infield and covered him with a sheet. It had happened very quickly and because of the dusty conditions, most spectators knew nothing about what had happened;some thought it was just a minor accident, besides most were keeping their eyes on Brinker and Felker’s battle for first place. By the 31st lap Brinker had almost caught up with Felker. These two were almost side by side, Felker would pull ahead on the straights and then Brinker would catch him on the corners. Many of the miles were covered in 57 and 58 seconds. Both were out for blood! About this time people could see that Felker’s tire was starting to shred, by the 36th mile the rubber wasbeginning to peel off.On the 39th lap, as the two were coming out of the second turn, almost side by side, with Brinker on the outside, Felker’s right front tire exploded forcing both cars to swerve to the right, leaving the track through a fence and over a ditch. Brinker escaped un-scathed. Felker was thrown from his vehicle and crushed to death instantly by coming in contact with a post, head on, that Brinker had missed. A life taken way too early, a man doing what he loved. A man that gave his best for the purpose of the infant automobile industry whether in his profession or for pleasure. So ends the story of a pioneer of Colorado Motor Sports, his life summed up in the September 3, 1907 issue of the Denver Republican: “When the bicycle craze struck the country, he started into the business and became a leading dealer in Denver. He was an enthusiastic bicyclist himself winning many medals and trophies for his skill and daring. He was the pioneer in the automobile business in the Westand catching the motor fever he won notoriety as a racer. The same spirit of daring which he exploited as a cyclist was carried into his motoring, and he harbored the ambition of doing record feats of speed. He was a participant in every auto race of note that has taken place in Denver. He was a member of the Denver Automobile Club. Mr. Felker was extremely popular. He was known to almost everyone in the city and everyone liked him because he was genial and friendly, and treated everyone squarely.